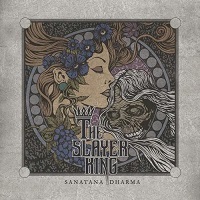 THE SLAYERKING is a Doom Metal band with dark Progressive, Gothic and Death elements based out of Athens, Greece. Formed in 2013, the band has been hard at work bringing us the eight-track album, "Santana Dharma". “She is My Lazarus” opens the album, with a slow, Doomy riff and some psychedelic fuzz in the background. The lyrics “you belong to me” are whispered like some creepy ringmaster leading a sideshow. I find the sound to be fairly repetitive as far as the lyrics go, and the track takes more than six-minutes to get its point across. “Black Mother of the Lord of Light” is slower still, with a grinding quality and a series of unconventional chord progressions in the chorus. This track lacks the Prog element that THE SLAYERKING has presented in others. “Sargon of Akkad” is deeper and darker, with three slowly played notes/chords in the opening riff that register almost impossibly low. There are some interesting things going on behind the riff in the main verses with the bass guitar and some subtle effects that add some texture to the song. “Magnificent Desolation” opens with a bass riff that builds up some suspension. The main riff is pretty heavy but the song never quite reaches a culmination for me despite gathering some steam in an extended instrumental section. “We are the End” actually puts forth some brightness to counter the powerful, chunky main riff in a manner that just adds up oddly. “My Lai” has more acoustical sounds than fuzzy distortion and I think the former does a better job of conveying gloom than the later. “The Man that Never Was” circles back to a harder sound from the start but adds some pleasing harmonies in the background. I like this song best on the album because it strays from the path of the previous tracks. “Southern Gate of the Sun” closes the album, it features a plodding riff provided mostly by the bass guitar, I think it has more impact than some of the other songs on the album in terms of memorability. Overall, this is certainly one of the most unique albums I have heard under the Doom umbrella in general. I don’t quite feel that it met its potential as well as it could have.